Like many great directors of the studio era, Kihachi Okamoto, who succumbed to esophageal cancer in 2005, honed his skills on assignments, mainly comedies, dramas and action pictures. All About Marriage, made in 1958, was his first feature film, after climbing the ranks of the Toho studio for 15 years as an apprentice. "All those first movies were assigned to me", confirmed Okamoto in an interview with Chris D. for the latter's book Outlaw Masters of Japanese Film. He would have to wait until Desperado Outpost and Oh Bomb ! to direct two scripts of his own - unfortunately, the latter film would truly bomb. In the main role of All About Marriage, young singer turned actress Izumi Yukimura countered Toho’s misgivings about her acting abilities to deliver a strong, convincing performance, while Michiyo Aratama perfectly embodied the homebody type of woman. The film also features small parts by Toshiro Mifune (as an unlikely stage teacher!) and Tatsuya Nakadai (as a businessman), who agreed to play pro bono in order to support Okamoto’s directing debut. While sketching a pithy portrait of postwar consumer society, both in its new, confused individualism and use of "iconic images" to sell products or concepts at all cost, All About Marriage is a bittersweet exploration of people’s everyday life at the end of the 1950s, young bachelors and married people alike. To write the story, the studio conducted a population survey among young women, asking them to talk about their lives, tastes, etc. The film possesses Okamoto’s typical taut rhythm, sharp editing style, epitomized in the musical tour de force of a rockabilly concert that features Mickey Curtis. But despite all the zippy and witty dialogues, All About Marriage fails to be decidedly original script-wise, leading to a morally conservative ending where the young heroine opts for omiai - that is, arranged wedding - and thereby discards her quest for fulfilment in true love. 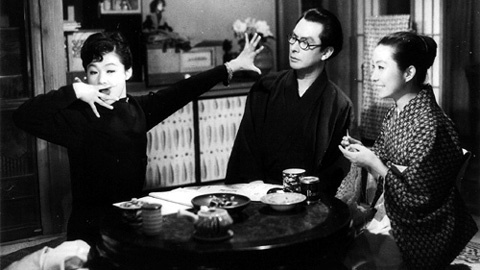 The general feeling is that All About Marriage looks like many social comedies of that period of time, blending the traditional genres (like the haha mono or mother stories) with the new social trends and postures, while pointing to Okamoto’s potential to be a great – not to say the greatest - rhythmical director of Japanese cinema.